1.) Settlement Cracks – These common cracks usually manifest as a ‘stair step crack’ or a crack that steps up as it moves horizontally across the wall. Found at or close to the corners of the home, wing walls and quoin corners they are common and easily repaired. Just watch and expect more movement if the settlement has not stopped. Solution: Contact your local masonry repair pro and/or a structural engineer for an evaluation. Some cracks are simple for a repair pro to check and others may need an engineer’s analysis and testing to find the cause and recommend the type of repair needed. Solution: Contact your local masonry repair pro to have these cracks repaired or caulked. Caulking will move with the materials and help reduce future cracking. Michael Olding is tradesman and consultant in the field of restorations and repairs and now operates a restoration and repair business in Cincinnati, Ohio. He is also a Master in the field of masonry construction, restorations and repairs. 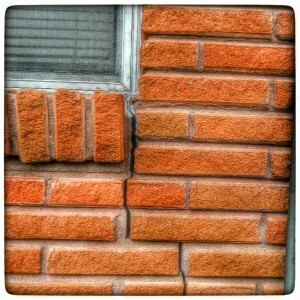 This entry was posted in Articles and tagged mortar repair crack problems. Bookmark the permalink.